Community Council and a Photo Shoot. Lovely, quiet, crisp winter weather for the last couple of days,one of which I went fishing but today decided to stay ashore and feel guilty about not going out. For a day of feeling as though I had not done that much still managed a dog run and work on the wood pile, a little bit of book work and then a Community council meeting in the evening. A couple of visits to the Inn where it was all happening today and a lot of banter/craic as well. There was a photo shoot for a book called Scottish Relish, hope I have that right, featuring the excellent food produced at the Inn. Along with the crab, lobster,langoustine and venison Aron was up with his kraken rum and raison ice cream and with an extra drizzle of rum over the top, just playing to the camera of course. There is a fair bit going on with a couple of big christmas groups at the Inn and Aron’s curry night on saturday. Be back working for that as apart from the Sunday lunch session , I have not been doing many shifts over the last couple of weeks. Tonight’s CC meeting went well, quite often feel that you want to make it short and get home early but that’s not really fair and once you are there you find there is a lot to discuss. I always think that keeping it friendly and humorous helps as long as that does not detract from serious business. On e of the correspondence items was from the HC to all CCs asking, due to cut backs, if they would identify paths etc that they could now clear themselves. HC would provide high viz jackets and snow shovels and the CC would organise the work on the ground. As it turned out we decided that we are well covered and our road men do a really good job on our roads and the few pavements we have. It was only when I got home I realised that we are almost going full circle in that it is being suggested that we clear our own patch as the HC cannot do this any longer. In the last post I was reminiscing about a squad of local men going up the Hill to clear it, are we heading back to those days where we look after ourselves more and more as a community? For some of us that may be a learning process as we have been used to being “looked after”. The older, more resilient folk, no longer do the physical work that may be expected of people now living in small rural communities. Seeing as how it took half a day for two JCBs to clear the snow drift I wonder how long it would have taken a squad of high viz guys with shovels? The AGM minutes are now out and there was some banter about them in the Inn tonight. Seeing as how they came out in time for the AGM this year but only just, they are now already out now, it was suggested that next year’s will be out before our next AGM!!! On a more serious note we do have to try to solve our Bealach closure problem and contact will be made with our area office over the next couple of weeks to work something out. The road closed on Wednesday evening and was not opened until yesterday afternoon when, if we had a snowblower it would have been closed for a couple of days. Short term weather forecast says that it may not be too much of a problem over the weekend..back to rain and wind. Last of the quiet days tomorrow so may take a look out and haul a few creels see what is in them. Feeling a little bit bruised but never bowed. Firstly I would like to thank all the folk who have expressed their support for me as a person. Most folk I am acquainted with or friends with know that I do not seek the attention I have received over the last two or three weeks. My grandfather was given a croft in Toscaig over 100 years ago, he was welcomed into this community and from what I have heard about his life he returned that many times over. Although I know I fall far short of this in many aspects of my life that is what I aspire to, simply to be kind to others. The debate I had when starting a blog with Sam was great but the full implications have hit home recently. I do not regret anything I have written and, as said before, these are my views. Having just read an article in the WHFP I felt the familiar feeling of “oh no what now”. But having re read it the only thing that was missing and is important was the end of my reply to the question did I agree with Brian Wilson’s article the previous week. I quoted from a letter written by John Wills and ended by saying the enquiry had to be directed to the Trust as I could not answer it. I have picked up a lot of different comments and arguments over the past three weeks and most are very emotional. I had a very interesting conversation this morning with some one who is reading about this aspect of decision-making and had an interesting way of saying that most decisions we make are emotional and we then spend an enormous amount of time and intellect trying to justify them. The one thing I have never defended at anytime is the status quo because I do not think it is sustainable. There have been huge changes over the past 30 years that I have lived here. On the positive side there is a community pier, a community hall, healthy heritage centre and many other groups but against that you look at the school role of 8, an ageing population alongside a falling population, crisis campaigns to re install our PO and keep our medical services. Most people who live here love this place and regard it as the Sanctuary,some who have lived here all their lives may not desire the changes that have taken place since growing up here and many who have come in see Applecross as a Sanctuary from the outside world and may not want anything to change from when they first came, all perfectly understandable. The fact of the matter is Applecross is not and never has been divorced from the outside world. In the past the change has come slower due to its isolation. Possibly one of the problems in recent times has been the speeding up of communication systems and globalisation has opened up the area so much to visitors who appreciate the peninsula and are welcomed in as an important part of the economy. But part of the process I see is the increasing vulnerability of communities such as Applecross due to events outside our control. Climate change, food and fuel poverty but there are many people living here who believe that we have the solutions within this community and that is why the Community Company is working with the Trust in trying to secure a viable wood supply for the community. I accept the fact that the Trust has been set up with objectives which involve culture, heritage and the environment and trustees draw a distinct line between that and the social and economic needs of the community. I have argued with the Trustees that this is a false demarcation and there has to be a coming together of all these objectives.Sustainable development is in the remit of the Community Company and needs more support from the Trust. I do not think you can isolate the culture of this place from the economic and social needs of the people, maybe this is the root of our problems. I think this is the only criticism of the Trust that I have voiced. On a practical point I have asked the link to my blog to be removed from the Community Company website. This blog has never been the spoken word of the Company and was fairly safe up until this political turn of events and it also keeps me free to express my views about life, fishing and community in the NW of Scotland, and I thought …….but so glad of the SEA course and the guys who were on it as it keeps me with a sense of realism. I am not fearful of any campaign whether inside or outside Applecross and find the whole subject of land and land reform fascinating and I know this will not go away. There are many rumours, maybe even a petition to sign, and lots of opinions swirling around and I actually think this a good sign that the community is alive and kicking. This is what happened when the Community company was formed and since then we have a Community run Filling Station, just about to refurbish the Toilets and set up a pilot Community Broadband system, with the Hydro scheme making progress and looking at Toscaig pier and the surgery grounds, all for the benefit of the community and whatever happens this will continue. Very slowly the Community Company is increasing its capacity with more people actively joining in, the latest example being the sub committee to roll out the broadband throughout the rest of the community. And you know, life goes on, with the fishing still holding up, a lovely day on the water on Tuesday with another hoped for tomorrow. It is good to get out there to get a proper perspective on things. Even living in such a beautiful place like this we do seem to complicate our lives so much but a day at sea seems to settle things down. 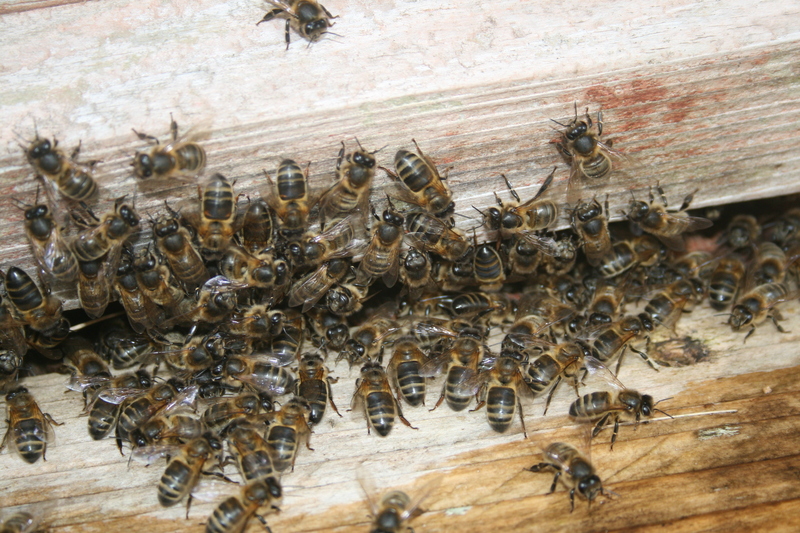 It is a pity that it is raining hard today or I would be out watching my bees going about their business. Lovely black bees who seem to have settled into their new home. They are feeding well having scoffed 4 kilo of sugar since arriving in Applecross. Not so good news on the hen front and I have admit temporary defeat at the hands of the pine marten. We were woken up to the screams of one of our remaining 3 and although rushing out at 2 am was unable to save her. Found lots of spraints around the house has meant that we have a pine marten that is practically resident with us. The remaining 2 have been taken down to the hen care home in Toscaig where hopefully they will have a happy life in amongst their new mates. Speaking of which Aron, the ice cream man, is now finding it hard to keep up with demand at the Inn. Thetubs of ice cream are disappearing as fast as they are being made and are receiving as much praise as other excellent dishes. Had milk chocolate and apple and bramble scoops last night for my “staff drink”. Sublime.